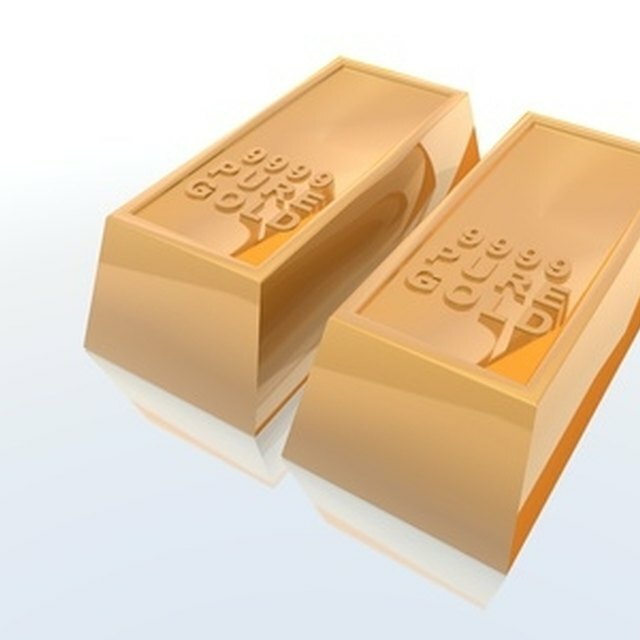 When it comes to gold bars, ingots and other bullion, the brand behind the gold is as important as the gold itself. Having gold bars issued by an internationally recognized assayer and refiner is like having a guarantee that your gold is pure and weighed correctly. Gold that is issued by known assayers routinely sells for much higher rates than gold by unknown refiners. One of the biggest and most sought-after brands of gold is Credit Suisse, which issues gold bars ranging from 1-gram ingots to 400-ounce institutional bars. If you are going to venture into the gold industry, you should stick with a brand that can be trusted, and Credit Suisse is about the best there is. Start by setting a budget for how much money you can afford to invest in buying Credit Suisse gold. While it is difficult to lose money investing in gold, you may occasionally find yourself in a position of holding onto the gold longer than expected while you wait for the market to shift. Because of this, buying Credit Suisse gold should follow the same philosophy as any other form of investing–do not invest more funds than you can comfortably live without. Follow the market price of gold. The market price of gold is referred to as the “spot price” and is updated twice per day to show how much the current value of gold is for one troy ounce (31.103 grams). The trouble is that individual investors always pay more than the spot price, because that rate is reserved for financial institutions that are dealing in thousands of ounces of gold per transaction. However, knowing the spot price still provides a gold barometer of sorts to measure how fair a selling price is. You can check the current spot price online by visiting the Kitco site. Check the Bullion Direct Nucleo Exchange for Credit Suisse gold being sold below market rates. The Nucleo Exchange is an open market place used by private investors, collectors, bullion dealers, refiners and others who are interested in buying and selling gold. Much of the gold being sold on the Nucleo Exchange, particularly Credit Suisse gold, will be sold at market rate or above, but in some conditions, you will find speculators attempting to quickly unload gold below market value. This is the time when a sharp investor will want to buy. You can also post the rate and volume at which you are willing to buy and sellers will contact you with their offers. Keep close tabs on Internet auctions being conducted on sites such as eBay.com. You will often find Credit Suisse gold bars being sold at these auctions and sometimes they will be auctioned for less than market value. Any time you can purchase gold below market value is an opportunity to earn fast profit, since you can turn around and sell it as soon as you take possession of the gold. Many Credit Suisse bars will also be auctioned over market value, because they are in higher demand than other gold auctions, so keep a close eye on both the auction and the current spot price of gold before you enter a bid. Use the American Precious Metals Exchange (APMEX) as a source for buying Credit Suisse gold. APMEX focuses primarily on selling gold coins, bars and bullion to private collectors. As such, prices are based upon the collector value of each specific item. In the case of Credit Suisse gold bars, this is almost certainly the wholesale market value, or spot price. Sometimes the gold market will take a dip from day to day. These instances represent the time to buy Credit Suisse gold from APMEX, because the market value will have raised by the time you receive the gold, meaning you can instantly sell it for a profit (more often than not). Manage your inventory. You should keep an inventory list of all Credit Suisse gold bars and ingots that you have purchased. Each of these comes with a unique serial number. You should track your inventory by serial number, keeping track of the weight of the bar and how much money the bar was purchased for. Tracking your inventory of Credit Suisse gold in this manner will prevent you from accidentally selling a bar for less than the amount it was purchased for. Sell your Credit Suisse gold at an online auction. Internet auctions at sites such as eBay.com are a popular place to sell gold, particularly Credit Suisse gold bars and ingots. These items commonly sell for higher than market value, meaning that you can often turn a higher profit from an auction than you would from selling the gold through other means. Auctions do occasionally sell for under market value, so you may wish to place a reserve price on your auction, meaning that your Credit Suisse gold must sell for a set minimum rate or else you do not have to honor the auction. Use the Bullion Direct Nucleo Exchange to sell your Credit Suisse gold. The very same Nucleo Exchange that can be used as a resource for buying gold can also be a valuable tool for selling gold. The Nucleo Exchange is used by a variety of different people, ranging from private buyers to refiners to large scale investors. This mix of people can often lead to some of the most attractive rates available when selling your Credit Suisse gold. It is also very easy to use, because all you have to do is list the price you would like to sell your gold for and wait for the offers to come in. Make your Credit Suisse gold into jewelry, which will be easier to sell. If you have the smaller-sized ingots by Credit Suisse, such as 1 gram, 2.5 grams or 5 grams of pure gold, then you can easily make these items into pendants for necklaces. All you have to do is buy a gold bezel and place the Credit Suisse gold inside the bezel. You will have a gold necklace pendant that can be sold as jewelry to private individuals or to your local jewelry store. If possible, buy Credit Suisse gold that is still sealed inside an assay card. This card lists the serial number on the gold, the weight of the gold and the purity of the gold. The certification on the assay card increases the value of your Credit Suisse gold and is preferred by most buyers.